Minister of Environment and Climate Change Catherine McKenna speaks during the Canada 2020 Conference in Ottawa on June 5, 2018. Canada’s Minister of Environment and Climate Change is vowing to go around provincial politicians who oppose her government’s climate agenda, saying she will work with municipalities and corporations instead. 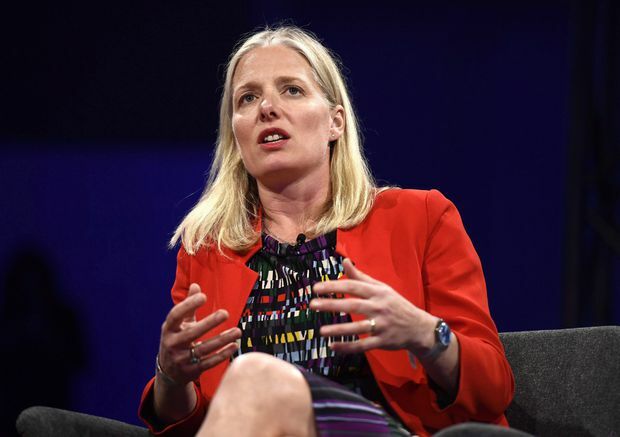 “The challenge is with conservative politicians who don’t seem to acknowledge the costs of climate change, and they don’t seem to understand the economic opportunity,” Catherine McKenna said in a recent interview with The Globe and Mail. “If they’re not committed to climate action, we will work with people who are,” she said. On Thursday, the minister began doing just that in Ontario, announcing that the $420-million remaining in the province’s Low Carbon Economy Fund, which was established to help provinces reduce greenhouse gas emissions in a bid to meet Canada’s Paris agreement commitments, will be distributed to cities, hospitals, universities, schools and businesses to help with efficiency programs and other emission-reduction efforts. Ms. McKenna said she is modelling her efforts at home on Canada’s work “with U.S. states, U.S. cities, U.S. businesses” on climate change after the election of Donald Trump, who pulled Washington out of the Paris agreement. Similarly, if “the [Premier Doug] Ford administration is not committed to climate action … we’re going to work with the cities, the schools, the hospitals, the businesses and Ontarians who want to be more energy-efficient,” Ms. McKenna said. The federal environment minister spoke to The Globe during a trip to China last week, where she signed an agreement to work more closely with Beijing on climate change. But reaching an understanding with Ontario remains elusive. Mr. Phillips earlier questioned the fault Ms. McKenna found with conservative politicians. Ms. McKenna, however, argued that Ottawa wants to create incentives for lower-carbon solutions. “There’s going to be a price on pollution. If it is free to pollute, there will be more pollution,” she said, speaking in Beijing after meetings with senior Chinese officials to discuss environmental issues. Last week, Ms. McKenna signed a memorandum of understanding with her Chinese counterpart, Li Ganjie, Minister of Ecology and Environment, that will allow for greater government and corporate co-operation between the two countries. Ottawa’s alignment with Beijing on the environment comes at a time when Chinese emissions are growing quickly, while those in the U.S. continue to fall. But Ms. McKenna voiced faith in Beijing’s leadership, repeating some of the country’s mantras – a “Green Belt and Road” and the idea of “ecological civilization” promoted by President Xi Jinping. She dismissed fears that a trade war with the U.S. would prompt Beijing to renew stimulus spending and, with it, the environmental toll of building new highways, rail lines and bridges. China’s rising international influence has raised concerns about Beijing imposing its will on foreign countries. But Ms. McKenna said Chinese leadership, because of the scale of people and companies it can marshal, can also be a force for spreading low-emissions technologies, inside and outside its borders. “China has an opportunity to scale like no other,” she said, pointing to Chinese investments in renewable energy, which have dramatically decreased the price of wind and solar power. Government policies have also helped bring a fast-growing fleet of electric vehicles to Chinese roads. The Trudeau government has been slow in pursuing some of its ambitions with China, including a free-trade deal and an extradition treaty, in part because of differing values and priorities between the two countries. But, Ms. McKenna said, the climate file has offered a chance for Canadian corporations to offer clean-technology solutions to China, and for Ottawa to regularly speak with Beijing. Editor’s note: (Nov 28, 2018) An earlier version of this article incorrectly said Ontario is Canada’s biggest polluter. This version has been corrected.